Eating Disorders, particularly one like Anorexia Nervosa, has been experiencing an increase in the development of social media and technology. Eating disorders can occur in people of all ages and backgrounds; it doesn’t discriminate. But, in the more recent years its taken a heavier toll on the teenage population. Focusing particularly on the teens in South Florida, Anorexia has become overly prevalent, and body image affects 40-60% of the adolescent population. Anorexia is a disorder created by the limitation of food to the body; people are purposefully starving themselves because they see themselves as being “too” overweight. At my high school, there have been initiatives to spread awareness about eating disorders and other topics through programs like Health Information Project (HIP). I believe that involving schools with programs like these, bringing people to speak about their experiences with the disorder or even just starting the conversation in classrooms can be the change that is needed to stop the growth of deaths by eating disorders. Any comments, concerns, or even suggestions on how to create this much-needed change feel free to comment/contact me. “Anorexia Nervosa.” Wikipedia, Wikimedia Foundation, 22 Apr. 2018, en.wikipedia.org/wiki/Anorexia_nervosa. “Eating Disorder Statistics • National Association of Anorexia Nervosa and Associated Disorders.” National Association of Anorexia Nervosa and Associated Disorders, www.anad.org/education-and-awareness/about-eating-disorders/eating-disorders-statistics/.i.cdn.turner.com/cnn/interactive/2012/03/health/infographic.eating.disorders/eating_disorders_2.gif.movietvtechgeeks.com/wp-content/uploads/2017/12/eating-disorders-statistics-breakdown-neda.jpg. popsugargirlsguide. “Heartbreaking Video Shows What Eating Disorders Really Look Like.” YouTube, YouTube, 28 Feb. 2016, www.youtube.com/watch?time_continue=89&v=CVifJ6I-i7g. 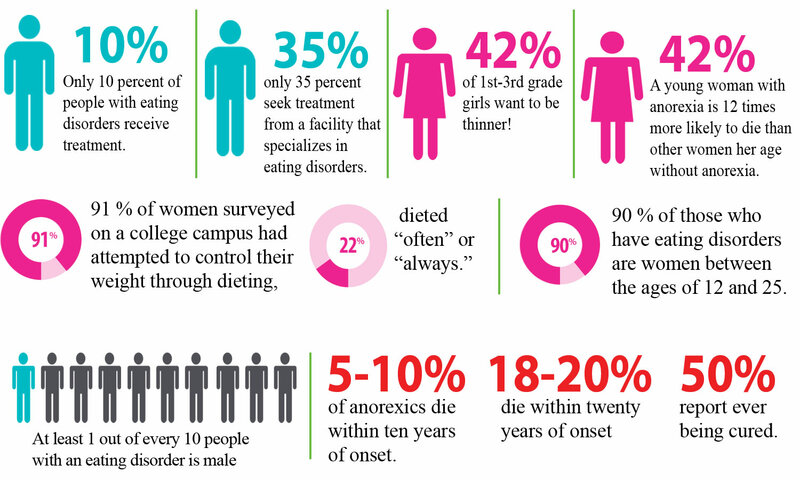 “Teen Anorexia Statistics.” Teen Help, 24 Feb. 2016, www.teenhelp.com/eating-disorders/teen-anorexia-statistics/. watchcut. “Fat | Eating Disorders | One Word | Cut.” YouTube, YouTube, 22 Feb. 2016, www.youtube.com/watch?time_continue=149&v=UWXwIPs-xWg. Great presentation on the effects of eating disorders on teenagers. Your incorporation of statistics and and bold colors really made the facts stand out, which was helpful for my learning. It is both shocking and extremely sad that “every 62 Minutes someone dies from an eating disorder” and it really gets you thinking how many of those deaths could have been prevented if they had gotten the necessary treatment. I would love to know of solutions or steps that we, as highschoolers in various schools, could take to ensure that our peers are both happy and healthy. Hi! I’m glad you liked it. I agree, when I was first researching on the national level the statistics that appeared were extremely shocking. I picked this topic because I knew people that had experienced Anorexia first hand and had received the treatment to get better. But as high school students I think that the first steps would be to develop a community that has a sense of empathy. and also just being able to have that conversation with a friend or in class about how they’re feeling can be instrumental to ensuring that everyone stays happy and healthy. I really liked that you included anonymous quotes from teens who have suffered. I think that hearing these straight from the person really helps the reader to empathize with what you are saying. I would love to know solutions that you suggest that are reasonable for us as high schoolers to implement into our daily lives. Hi!! I really appreciate your thoughts and comments. I think as high schoolers the day to day stress of school, social media, home, and everything else can play a big role in developing these kinds of disorders in todays youth. But something that I think would be reasonable to implement into our daily lives would be to talk to someone. Talking to someone about how your days been, how you’re feeling; talking about absolutely anything that makes you happy can be the start of change. Your presentation was great and informative. I really think that the effects of eating disorders on teenagers aren’t talked about at all in our society. I was hopeful to see that you care about it enough to make this presentation. I think that the statements from students really help with internalizing the struggles of having an eating disorder. Overall, great job! I also loved that you included anonymous quotes! I also loved the video very engaging. Loved the work you did! This topic is very important to talk about, especially as so many young people suffer from this disorder. The TED talk you included really brought a personal perspective, as well as the anonymous statements. The layout of your presentation was also very effective, and easy to understand. Well done! Hi Lauren. I learned a lot from the statistics on your presentation, and the visuals you used were very powerful. Great project. Lauren, I thought your presentation was very engaging and the infographs really helped me visualize the statisitics. The Cut video was also very touching to watch + great way to end your video. I loved how the girl towards the end talked about how she sees moms saying “dont eat that or you will be fat” and how ironic it is that that’s their biggest concern. Parents have such a large influence on their children and they should know how their words can really determine their child’s life. Yes I completely agree. I think that words have a big impact on people in general whether it comes from a parent, a friend, or even a stranger. Being mindful is one of the things that people need to be in order to see change. Hello Lauren, I really like how you discussed a really deep and sometimes uncomforting topic to talk about like this and with confidence, I also felt that the anonymous quotes were really nice and a good idea to implement in your project. This was an informative and moving project about an extremely important issue. Things that jumped out to me were the three lines of stats at the beginning of the presentation and the anonymous quotes. This was a great presentation! I think the statistics really hit home for me and taught me more about a very prevalent ailment in society. Even more powerful were the statements that you took. It’s sad to see people unsatisfied with their bodies and feel the need to eat less and less, but hopefully awareness, such as this presentation, will help create a larger movement. Good job!